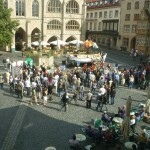 The association based in Hildesheim was founded by a group of Sudanese and activists from Germany. The objective is to initiate a dialog based on humanitarian and cultural aspects, bring awareness to the German public on the situation in Sudan and about the Sudanese refugees in Germany and the promotion of small health and education projects in Sudan. 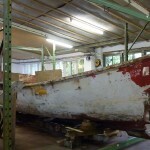 Last year, the club had a well-prepared and well attended 2-day event organised in Trillkegut in Hildesheim, where expert speakers were invited to speak on various topics. 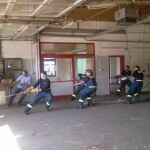 On this occasion we were impressed with the high quality of the work of this association. Our meeting was to get to know each other and to exchange information about each other. We also had the opportunity to learn about the tiring and miserable situation of Sudanese refugees in Niedersachsen, who are forced to remain idle due to their work prohibition. Any prospect for these people seems to be missing. We want to continue this meeting and gladly discuss possibilities of cooperation. Will Europe underdevelop Africa again? Economic Partnership Agreements (EPA) are a scheme to create a free trade area (FTA) between the European Union (EU) and the African, Caribbean and Pacific Group of States (ACP). 1. In order to have continued access to European markets, Africa is required to eliminate tariffs on at least 80% of imports from EU. In some cases, abolish export duties and taxes or retain existing export taxes but not increase them and moreover eliminate quantitative restrictions. 2. Under World Trade Organization (WTO), Least Developed Countries (LDCs) are not required to reduce tariffs but under EPAs, it is as high as 80%. In the current framework of EPA, Africa is being asked to comply with more stringent conditions than BRIC (Brazil, Russia, India and China) under WTO. 3. The fallouts are for example African countries cannot use government procurement and contracts to prop-up domestic companies as European companies would be required to give equal treatment. 4. The emerging economies of BRIC are threatening the global economic, military and geo political landscape. With these new pressures a demand for exhaustible natural resources and new markets to sustain national security seems critical. It could only be expected that the EU would move quickly to secure its possession. Since the major powers are no longer able to make use of WTO to impose new rules on developing countries, they are resorting to bilateral and regional policies and agreements to try to get their way. 5. In many aspects this agreement reflects the Berlin Conference of 1884-85 where the African colonization by European powers was actually formalized in the name of “suppressing slavery”. Similarly, in the guise of ‘helping and aiding’, the EU is acting in self interest. It is the old classic ‘divide and rule’ policy, while EU can negotiate as a bloc, the ACP countries are divided into seven regions, sometimes not exactly matching the regional integration arrangements. If the issue is ‘development’ of Africa, there are certainly superior alternative proposals for a more beneficial relationship between Europe and Africa. The African Union, various sub-regional groupings and even the ACP ministers of trade have canvassed alternatives to EPA. History should not repeat itself. 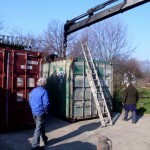 Today, a used 20 ‘container was delivered to us from Hamburg. 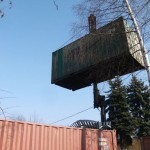 We want to repair the container and apply a new coat of paint. Possibly as early as March of this year, supplies intended for the activities of the association learning-Help-life (LHL) in Togo will be loaded. In addition to solar equipment, we will be loading refurbished tools for farmers and bricklayers, a tractor plough and a cement mixer. Even before the first official collection drive, our union colleagues from Sehnde have already received a lot of donations – including 10 manual pedal sewing machines. 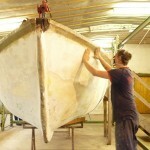 Many hands contributed to the success of the Burundi boat project. 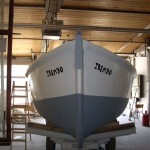 In 2009, the THW helped us to transport the hull from a rented garage in Steuerwalderstrasse. Little did we know at that time that the boot would float in the finest and road worthy lake, Tanganyika. 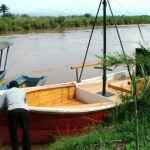 The Hanoverian Association IREMBO and its chairman Gerard Niyimbonera suggested to us that the boat could be used by Burundian adolescents to travel from the capital and port city of Bujumbura in Burundi and also provide a way for them to earn additional income by way of transportation. The youth from the Labora youth workshop could showcase their talent through the program “strengthening of locals”. 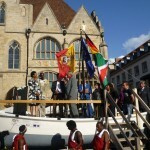 Supported by the workshops of Arbeit und Dritte Welt, with the assistance of BBZ and coordinated by the Youth Department of the city, the boat was finally handed over to the Ambassador of Burundi in August 2010 at the Hildesheim market place. 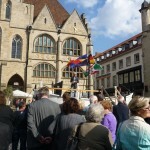 The financial support for the transport from Hildesheim to Burundi was initiated by the Honorary Consul Dietrich von Berg to Burundi. 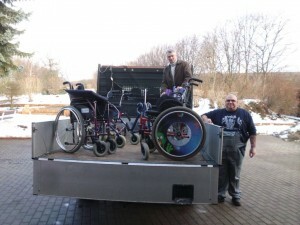 The transport finally went off without a hitch in fall 2011. 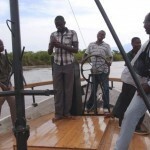 The boat has since travelled many miles on Lake Tanganyika. 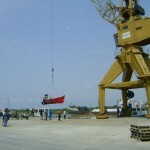 Gerard Niyimbonera personally supervised its use on location. 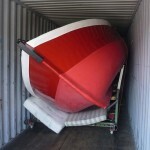 It floats and it moves elegantly. We have received donations of wheelchairs, walkers and canes from Magdalenenhof and Johannishof. 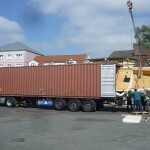 These donations are earmarked for a relief shipment to Cameroon. 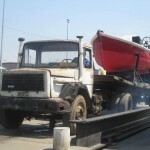 The financial resources for the implementation of the project had to be raised and a request for a transport cost subsidy had to be submitted to the government-owned GIZ – this was thankfully accepted. 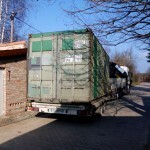 The container, which was already standing on our premises, needed another security certificate from the DEKRA. A damaged spot on a corner post had to be repaired and holes in the ceiling had to be welded. Also, a new protective coating was needed. 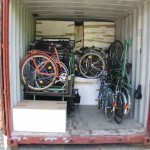 33 bicycles, 10 load wheels and 30 manual pedal sewing machines, tools and workshop accessories and spare parts were shipped. Bishop Wüstenberg, who was consecrated as priest in Hildesheim in 1982 went illegally to the apartheid regime of South Africa. There, he was given a farm on Mount Carmel in the province of Aliwal, he set out on the task of giving hapless young people a new perspective. 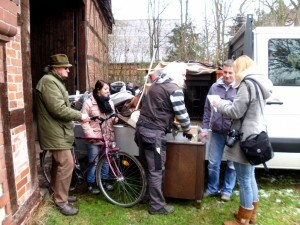 A bike rental, load transport wheels and manual pedal sewing machines will enable aid for self-help. With that it forms a full circle, linking school children in laboratories of South Africa to people with job opportunities at Arbeit und Dritte Welt. Means to do so, in this case are used bicycles, sewing machines and tools that have been saved from junkyards and landfills and thereby retaining their value again. The slogan is: Recycle and Reuse. That is sustainable for all involved. Today we had a visitor, our former colleague Jürgen. He was present in 1979 in Stadtfeld when we started clearing the fallow land to construct the building that we are currently in. If not for him and his colleagues, we wouldn’t have accomplished this feat. It is good to remember the past once in a while. 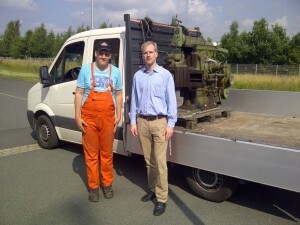 Horizontal slotting machines, also known as Shaper were made in Germany since 1905. 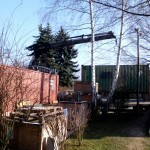 From the “Deutsche Maschinen- und Werkzeugfabrik GmbH“ in Glauchau, it became “Wotan-Werke AG” in Leipzig in 1909. Until the 1970’s the slotting machines were widely used. It was used to create surfaces and gears. 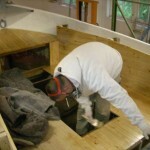 Later the slotting machines were replaced by milling machines. As these machines give a better finish quality, they are attractive even now. We would like to clean the machines and service them so as to offer them to our partners in Africa.